Have you ever wondered how to get the best finds at yard sales? Find out how someone else’s cool junk can be your cool junk too! As a college student, your bank account is always getting sucked dry from bills, loans, gas and taxes. With a limited amount of money in your pocket, or none at all, whenever you need to buy a new shirt, a pair of shoes or even an umbrella, you know that going to Aeropostle or Calvin Klein is out of the question. Instead, you find yourself shopping at Walmart, Target or thrift stores. I would like to introduce to you another thrifty way of getting good deals without having to break the bank. It’s called going to yard sales. Many people run away whenever they heard the words “yard sale” or “garage sale.” Why in the world would you want someone else’s trash that has been laying around in a dusty, old cardboard box for decades? Well the truth is, someone’s else’s “trash” might end up helping you save tens, even hundreds of dollars. Before you dismiss the thought, I would like to show you some tips and tricks of finding the best bargains at the best quality while rummaging at rummage sales. Look for Estate Sales! If you’re looking for high-quality dishes, pieces of furniture, electronics, books or movies at a decent price, then going to estate sales is your best bet! At an estate sale, family members or the owner of the house are selling most, if not all, of the belongings of the estate due to a recent divorce, downsizing, move, bankruptcy or death. Going to an estate sale will increase your chance of finding things that are not necessarily “trash” or “junk” as you might find at your everyday yard sale. Most of the objects for sale are still in good quality, and some have never even been used. Also, if you’re into collecting, estate sales are a MUST, because you might find a valuable collectable that could be worth more than the asking price. Be observant! Most people who go to yard sales have a habit of glancing around and leaving before two minutes are up. Something as simple as being observant can help you find a nice pair of gloves or a new wallet. Don’t be afraid of going through boxes of books or DVDs or opening plastic bags of jewelry. If you’re willing to take your time, you might find that patience really pays off. Have a vision! Those old mason jars could make cute flower vases or help organize odds and ends. A wicker basket can be spray painted a trendy color to be used as a magazine holder or blanket basket for the living room. Some old christmas lights could make great fairy lights for the bedroom or old picture frames can be spray painted and turned into chalkboards or corkboards for leaving notes. When you go yard saling, don’t leave your imagination at home! Things that look like junk can be refurbished or repurposed. It’s fun to get your hands dirty with a project every once in a while. Don’t be afraid to barter! Sometimes the asking price on on that little tag is only a suggestion. Don’t be afraid to go up to the salesperson and ask, “Could I get this for two dollars?” or “Could you give this to me for 50 cents?” Chances are, the owner of the yard sale just wants to get rid of as much stuff as possible and more than likely will give you the item at your asking price. Be polite, but don’t be afraid to bargain with someone, especially if you think the item might be overpriced or if you think you found a good buy! This will definitely save you even more money in the long run. 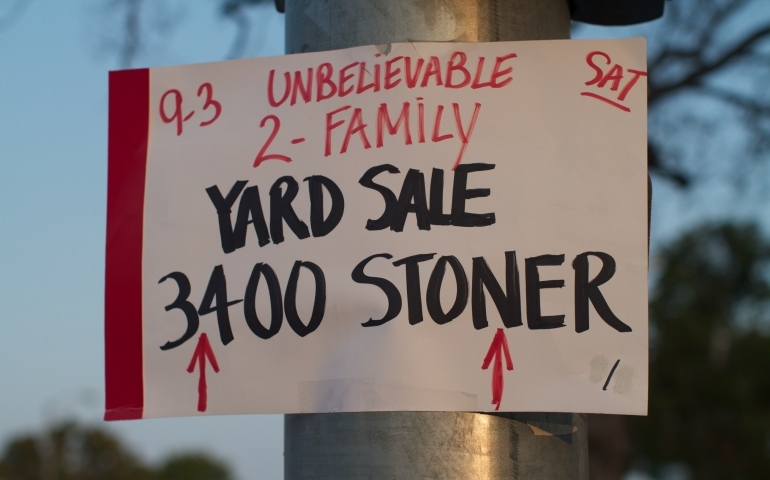 I hope these tips prove to be helpful at your next yard-saling adventure. Happy rummaging!